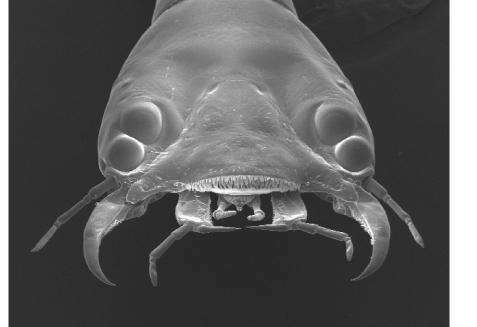 While study has long been conducted on vertebrates with sight-sensory systems involving a lens, retina and nervous system, new research reported by the University of Cincinnati and supported by the National Science Foundation is the first to examine how the complex eye system of an invertebrate - the Sunburst Diving Beetle - coordinates the development of its components. Despite the complexity of their eyes, including a bifocal lens, extremely rapid eye growth of the Sunburst Diving Beetle occurs during the transitions between larval stages. In addition, they temporarily go blind as the eye is quickly redeveloped. The findings by Shannon Werner, a recent University of Cincinnati master's degree graduate in the biological sciences, and Elke Buschbeck, a UC professor of biological sciences, is published in the November issue of Comparative Physiology A. The research focused on eye growth during the larval stages of the Sunburst Diving Beetle - which lives in creeks and streams around Arizona and the western United States. In its larval form, the beetle grows very quickly through three stages, or instars, of development. "What was significant about our findings was how rapidly the eye with the bifocal transitions into a new size," explains Buschbeck. "It grows so fast that after molting, as soon as we can measure it, it has already grown." "Because the lens needs to correctly focus images into the eye for both close vision and distance, the lens also has to be changing during this rapid eye growth," says Buschbeck. The eye tubes also grow dramatically during this transformation, making the lens temporarily dysfunctional - impairing sight of the larvae - until the lens reforms relatively quickly and vision is sharpened again in a period of around eight hours. The research examined eye morphology and optics around molt times, as the different stages of larvae shed and entered a new stage of development. To find correct developmental stages, the larvae were monitored on video around the clock to examine this process. The larvae were placed in an incubator with fluorescent light to achieve "daylight" and switched to two infrared LED lights to monitor development in the dark with a time-lapse camera. Each stage of larvae lasts a few days, but then they rapidly change during the transition between these stages. The dramatic growth of the eye tube that occurs between the second and third stage of larva development was investigated. The greatest overall growth occurred in the crystalline cone region, reflecting similar growth in vertebrates. 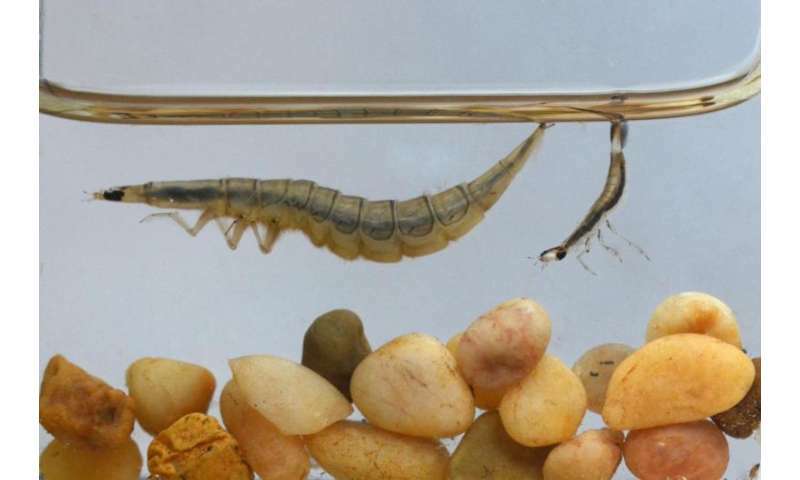 "We were intrigued that all major changes in eye tube length already had taken place at our first sampling point, which was taken within 60 minutes of molting," report the researchers. "This rapid eye expansion suggests a certain level of pre-determined eye growth, but specific adjustments also could be made at the level of the lens, which takes longer to reform. The lenses transformed more slowly during this period, affecting sight, but were back to being able to produce sharp, bifocal images within eight hours." Buschbeck says further examination is needed to see if osmosis plays a role in the rapid development, as well as whether there may be parallels with eye growth in vertebrates. "Studying the invertebrate mechanism, we can learn more on the basic principles which apply beyond invertebrates," says Buschbeck. Previous University of Cincinnati research revealed the bifocal lens on the top two eyes of the larvae, allowing them to simultaneously see features on multiple retinas within the same eye. These bifocal lenses have been found in four of the beetle larvae's 12 eyes.